i get to be the main character for the event, and share some personal views about islamic fashion and share how to style the jilbab for some kaWanku's loyal readers. not only me, Fashion & Beauty Editor of kaWanku Magazine, Sekar Puspitasari also had the part of showing us how to dress by body shape, coolness. 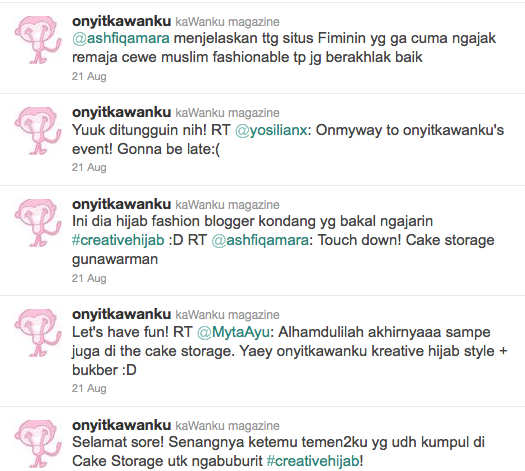 kaWanku's official twitter acc was quite active for the whole event, it's always nice to hear good news and good feedback. "Dress Tough for that you might have a Strong Heart"
i'm not alone, my friends Dwita, Aya and Yasmin/FiMiNin come to rescue my nerve, good to have them there. The beautiful audience, all of them got one FREE scarf from Ina's Scarf !